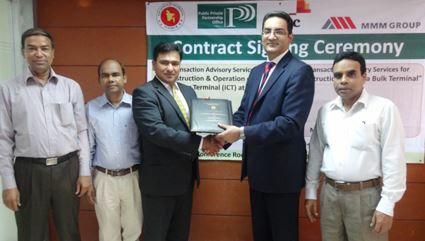 The Public Private Partnership (PPP) Office under the Prime Minister’s Office has on 30 March 2015 awarded a PPP Transaction Advisory services contract to a consortium of PricewaterhouseCoopers (PwC) and BMB Mott Macdonald and UNICONSULT Universal Transport Consulting Gmbh for Construction & Operation of Inland Container Terminal (ICT) at Khanpur on PPP basis. With exponential growth of container traffic at the port of Chittagong, container handling has emerged as an attractive business in Bangladesh. Majority of this cargo originates or is destined for Dhaka region including Narayanganj area and large portion of this cargo is transported by Bedford/panel trucks. This often causes congestion in Dhaka – Chittagong road resulting in delayed shipment deliveries. With Shitalakkhya River in the vicinity (Narayanganj), transportation of containers (intact) to Dhaka region can also be facilitated using Inland Water Transportation (IWT). For handling of such containers transported through the waterway, an existing jetty at Khanpur has been identified for development of a full-fledged Inland Container Terminal. It is expected that with redevelopment and full-fledged operations of the ICT will result in remarkable reduction in transportation cost as well congestion on the Dhaka – Chittagong road. The Transaction Advisory services contract focuses on undertaking a technical, commercial, financial, environmental and social viability study for construction & operation of Inland Container Terminal at Khanpur. The advisors will also support in designing a PPP structure for the proposed project. The technical feasibility will include detailed engineering surveys, design & analysis (hydrography, topography, master plan, river navigation) as well as environmental and social assessments. The transaction advisors will support the PPP office in designing a PPP structure optimising the revenue potential of the project and risk allocation amongst different stakeholders. This will aid to attract the best available companies in the bidding process. They would also provide assistance to the implementation agency in delivering the project, including developing bid evaluation, governance strategy and bid documents; project marketing; assistance in bid evaluation, project negotiation and contract signing; early operations support and transfer of knowledge. PwC is one of the largest advisory firms and the leading PPP / Project Finance advisors globally that provides industry-focused assurance, tax and advisory services to enhance value for its clients and their stakeholders. PwC is among the leading advisors in transaction executed globally. Mott Macdonald is a global management, engineering and development consultancy which will be providing the engineering, environmental and social expertise for the technical feasibility study. UNICONSULT is European consulting firm with distinctive level of expertise in planning and implementation of projects covering full set of instruments for a successful know-how-transfer.